By Tom Kertscher on Monday, November 6th, 2017 at 1:15 p.m.
Republican Scott Walker, after giving strong hints for months, has made it official: He’ll run in 2018 for a third term as Wisconsin’s governor. A half-dozen Democrats are already campaigning in hopes of running against him. In making his announcement on Nov. 5, 2017, Walker pledged to serve a full four-year term if re-elected. Shortly into his second term, Walker made a brief run for the 2016 GOP nomination for president. Here’s an overview of how Walker has done on the Truth-O-Meter since September 2010 -- when PolitiFact Wisconsin launched and when Walker was running for what turned out to be his first term as governor. We’ve fact checked Walker 182 times. He has earned a True or Mostly True rating 36 percent of the time; Half True, 19 percent of the time; and False, Mostly False or Pants on Fire, 46 percent of the time. Walker made his re-election announcement three days before the scheduled vote of the board of the Wisconsin Economic Development Corp. on a $3 billion contract with Foxconn. The Taiwanese high-tech manufacturer plans to invest up to $10 billion in a manufacturing plant in southeastern Wisconsin. The project has stirred excitement about the possibility of 13,000 jobs, but also caution about offering up to $3 billion in state incentives to a company that hasn’t always followed through on its promises. 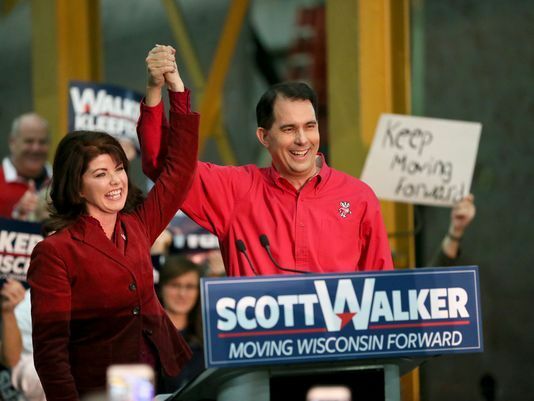 Despite Walker’s claim about what happened in Pennsylvania, the record indicates that by the time the Democratic administration there took over, little progress had been made more than a year after Foxconn and the GOP governor announced Foxconn’s plans. It's not as though there had been a deal in place that fell apart after the election. Foxconn itself has been more measured, saying the planned plant initially will create 3,000 jobs, "with the potential to grow to 13,000 new jobs." But the 13,000 is more than talk. Foxconn is pledging a $10 billion investment and the state is offering $3 billion in incentives, with $1.5 billion aimed at the creation of 13,000 jobs. Site selection professionals said they had seen improvements in Wisconsin’s business environment, but noted there was no consensus on how to define and rank the business climate between states. Walker’s claim was made broadly and without attribution, even though it referred to just one of many rankings that attempt to quantify data and perceptions on states’ business environments. The ranking he cited was the only prominent national ranking to put Wisconsin in the Top 10, aside from an index that focuses narrowly on small businesses. The state is on track to have generated more than $8 billion in tax cuts by the end of fiscal year 2019. It was actually nine straight years that Walker proposed county budgets that did not increase the levy -- the total amount of property taxes collected. But, to say he "pushed through budgets" that did not increase the levy was wrong. In eight of the nine years, the budgets adopted by the County Board -- over Walker’s vetoes -- raised the levy. And each year, Walker would use that increased levy as his proposal for the next year’s budget.